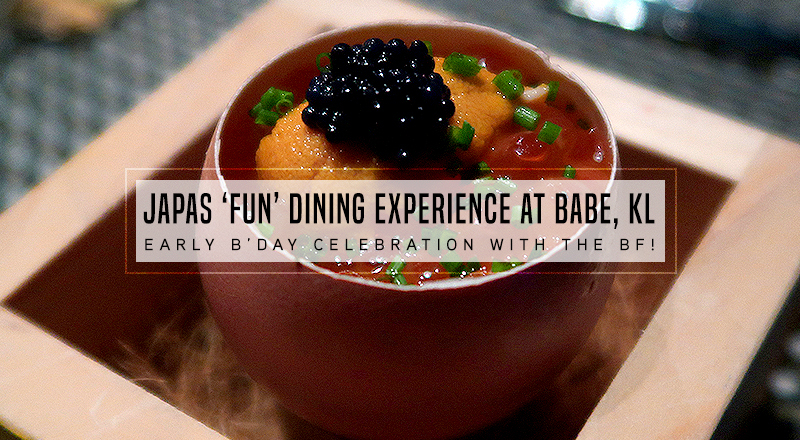 Early 21st Birthday Celebration with a Fun Dining Experience at Babe Restaurant | C A N D A C E .
Hello friends! 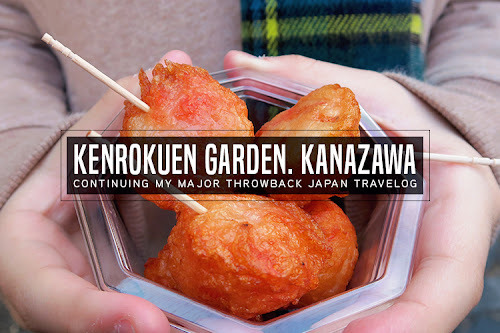 Today I'm back with another foodie post but before anything else, lemme thank my boyfie that's currently in Tokyo(the land with the best 7-11 and Lawson konbinis) eating all the uni, ikura, and ramen he can get his hands on---- for taking me to this restaurant for my early 21st birthday celebration! Yes, I'm not a baby any more guys!! 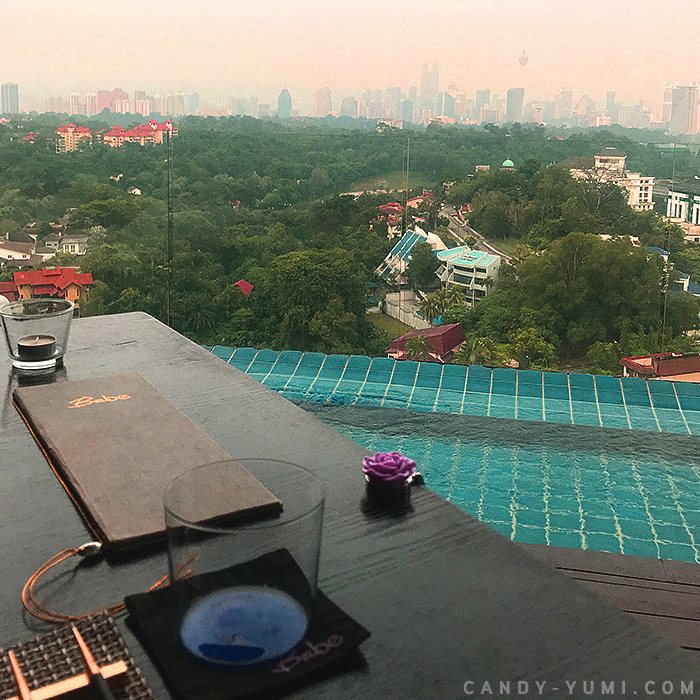 Our reservation is at 7PM and upon arrival the waiter brought us to our table right by the window facing the KL skyline. 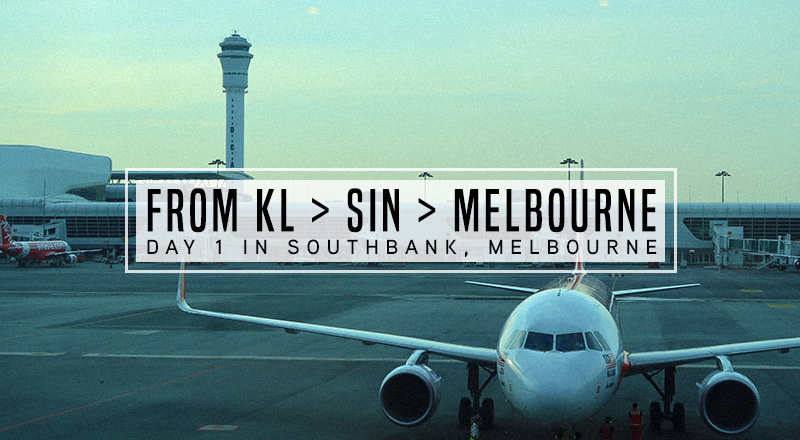 Too bad the weather was a little foggy over at KL, otherwise the view would've been perfect. When I saw that our table was located at a semi-open air area, I prayed for my makeup. Thank goodness it was actually pretty nice and cooling! After settling down at our table, the waiter explained the menu options to us. I believe there were 3 set menus to choose from along with a variety of ala-carte choices available. 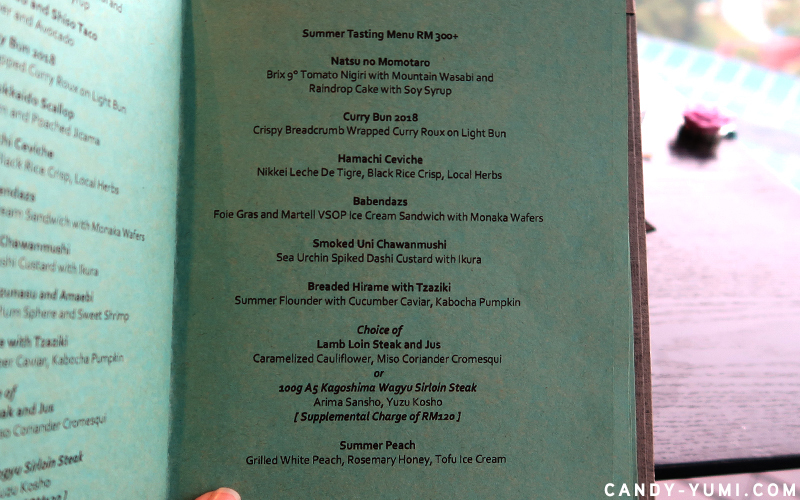 We both chose their mid-range Summer Tasting Menu featuring an 8-course meal priced at RM300+ per pax. 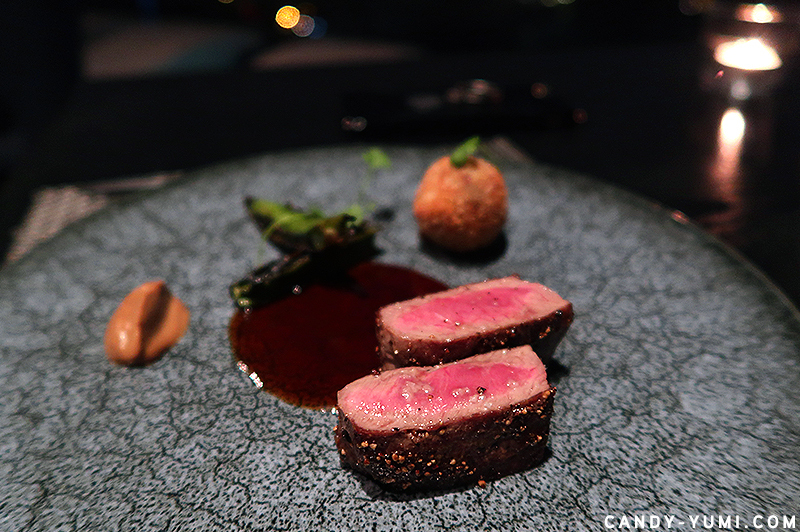 For the main course, there was a choice of Lamb Loin or A5 Kagoshima Wagyu (extra charge of RM120) and because we were tempted to try both, we ordered one of each to share. 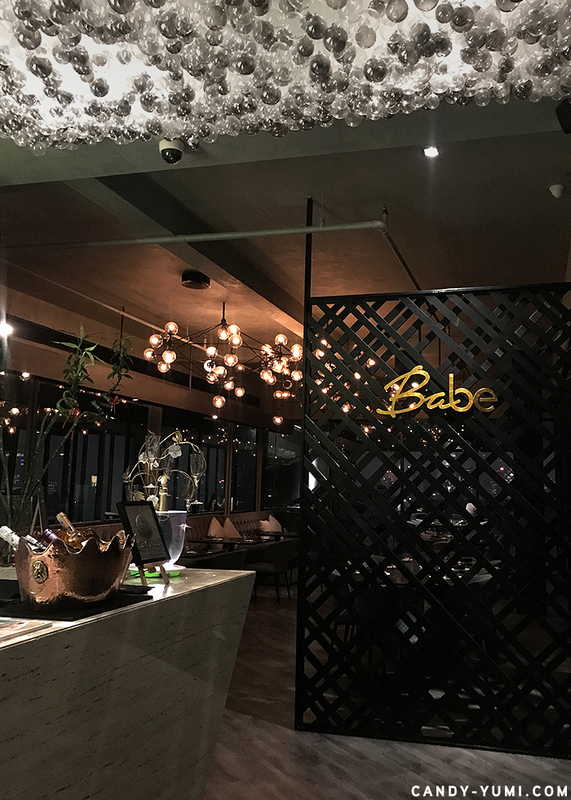 Babe Restaurant wasn't kidding about giving their diners a 'fun dining' experience. 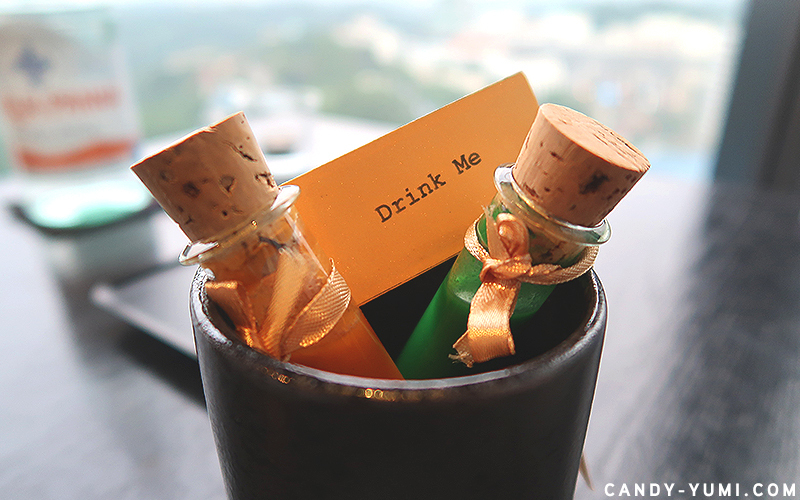 These two Alice in Wonderland inspired mystery 'drinks' are complimentary on the house to start our journey. The two tubes feature two different types of flavours and we were given some time alone to taste and guess before the waiter comes back to reveal the answers. No prizes if you get both right but either way it was still a fun start for the night! The green one tasted like chicken rice chili at first but there was something about it that tastes more than that and in the end my guess was spot on, the green blended drink was 'Chicken rice in a bottle'! 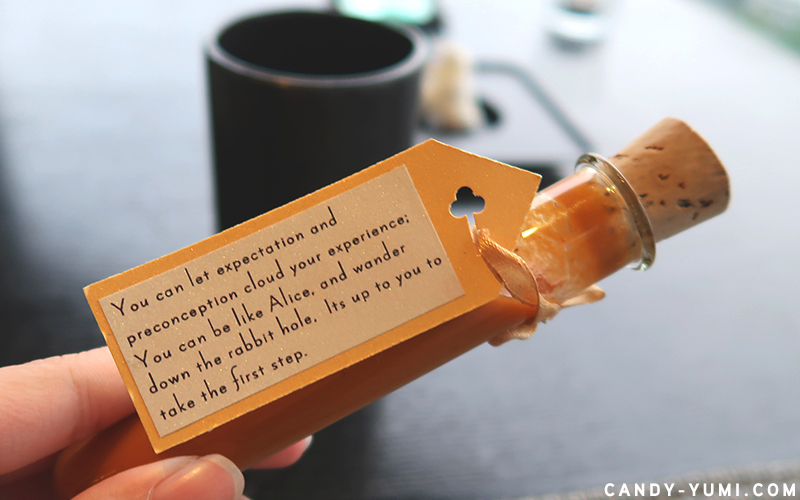 "You can let expectation and preconception cloud your experience; You can be like Alice, and wander down the rabbit hole. It's up to you to take the first step." For the orange drink I tasted tomato and herbs, a familiar taste that I absolutely loved. My guess was pasta sauce but the exact answer was Ratatouille. Close enough right?? This next dish is not part of the set menu. So happen my boyfriend is friends with one of the chefs working at Babe and thanks to his friend, Chef Alvin, we got some surprises from the kitchen!! This dish here was a little treat from Alvin featuring pineapples infused with alcohol (couldn't remember what alcohol though). 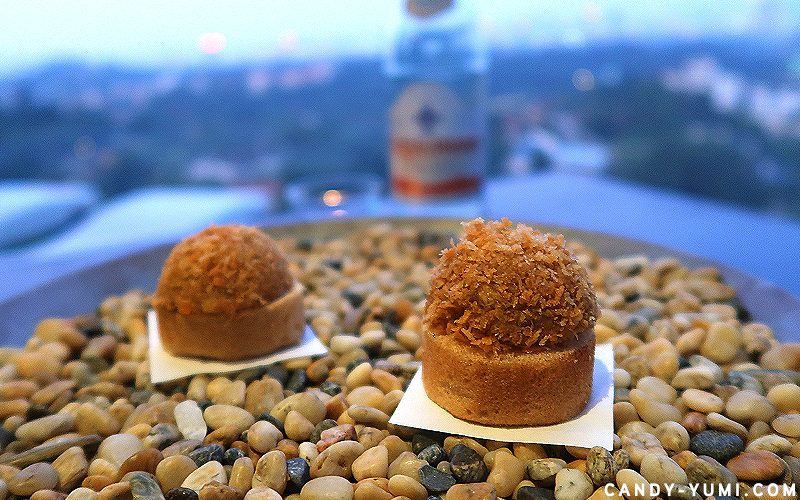 I love the big presentation of this simple appetizer btw. The bowl is literally a glass bottle cut into half! 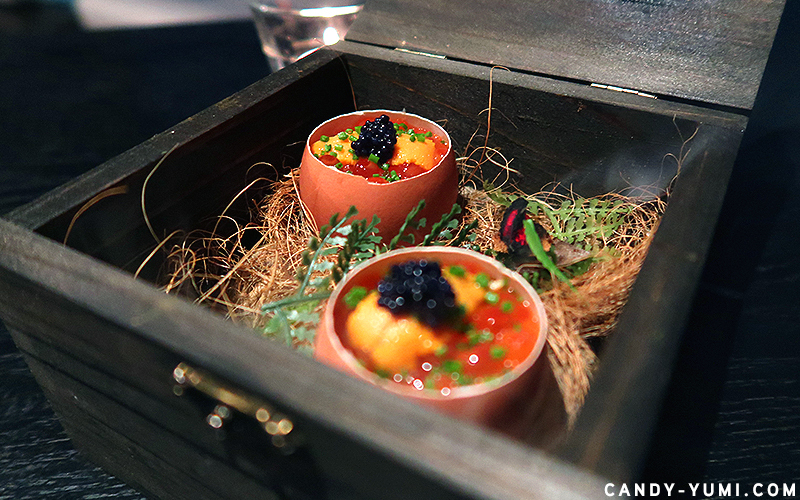 The first dish that's on the menu to grace the table was this dish called 'Natsu no Momotaro'. 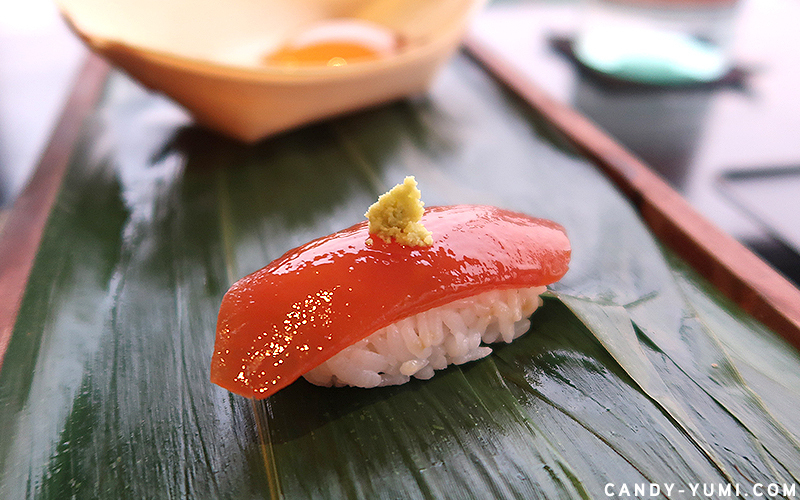 The dish features a Brix 9° Tomato Nigiri with Mountain Wasabi and Raindrop Cake with Soy Syrup + finely grounded bonito powder. 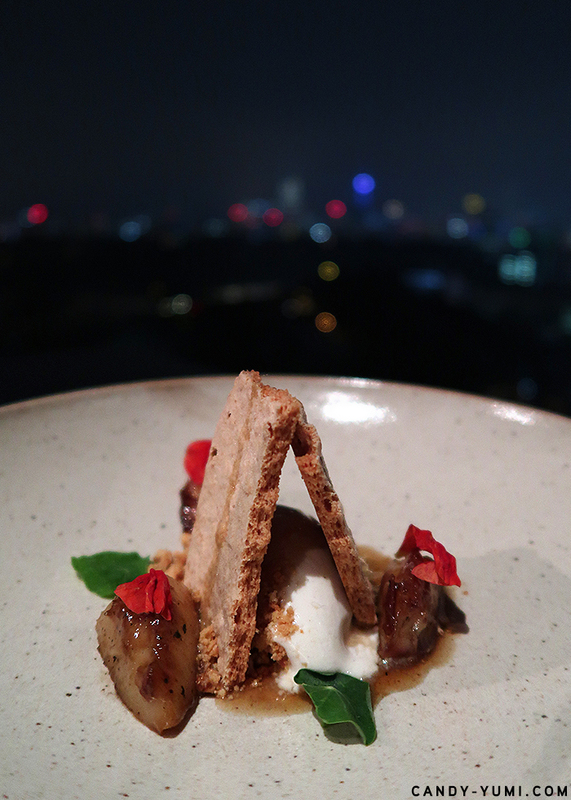 I've tried the usual sweet Raindrop Cake with Brown sugar and soy powder back in Ipoh so Babe's savoury twist on this dish was pretty interesting. The raindrop cake itself has no taste to it so people tend to experiment different topping combinations with it however this is the first time I've seen a savoury combination! If the waiter didn't explain the dish to us I'd probably be biting into a surprise! I have no idea what is a Brix 9° Tomato but from afar I really thought I was about to eat some maguro (tuna) sushi. The tomato was really sweet (like fresh ripe tomato sweet) and tasty, I'm usually afraid of wasabi but this one was OK for me! It had a baby kick but wasn't too spicy. The next Japas was something me and my boyfriend really wanted more of. This is their take on a Curry Bun and it tasted SO GOOD. I'm not going to grandma story you guys on this but simply put if you ever wonder how crispy japanese curry tastes like, this is how it tastes like but better. 101% will recommend! I don't remember if this is available on the ala carte menu but if anyone from Babe happens to stumble upon this post please add it in thanks!! 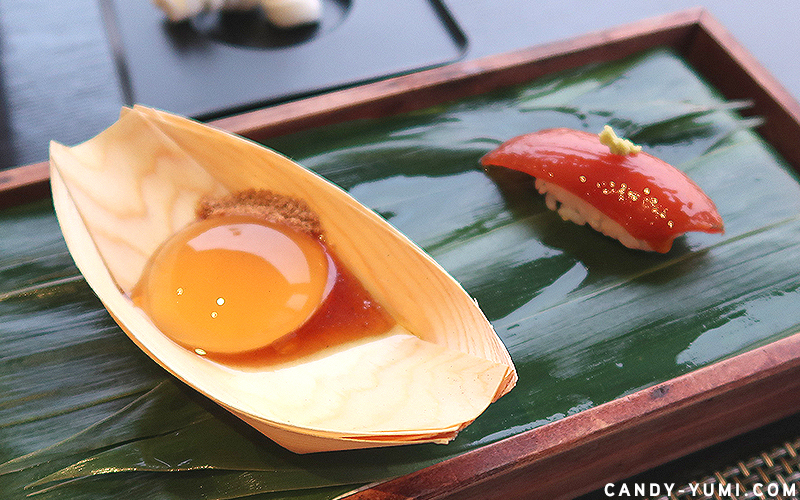 Following on we have another beautiful Japas called 'Hamachi Ceviche'. 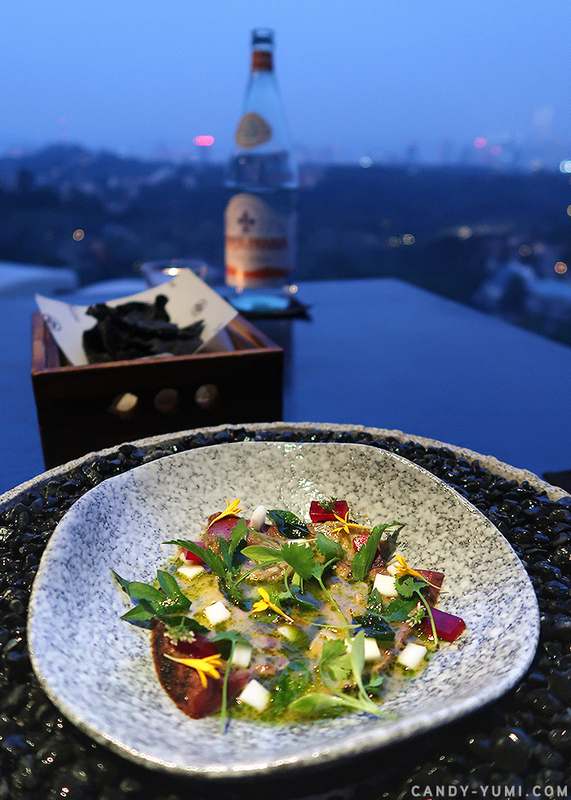 On the menu this one here is described as a 'Nikkei Leche de Tigre' served with Black Rice Crisps and local herbs. 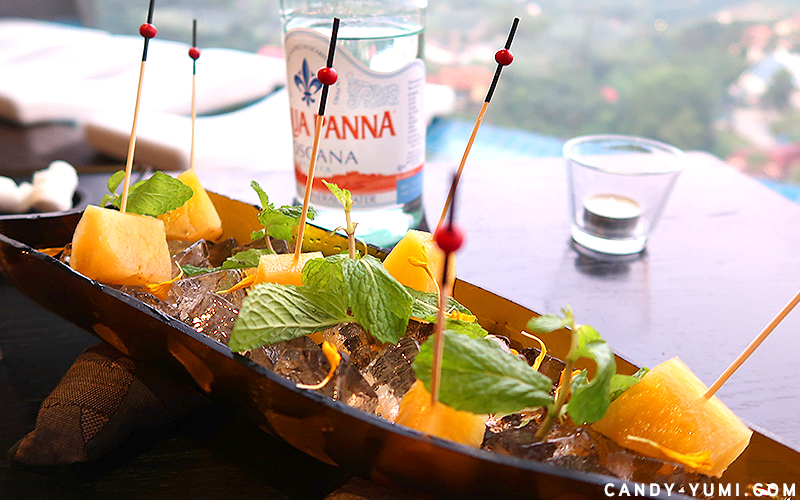 This dish is a Peruvian-Japanese fusion dish featuring torched Hamachi sashimi slices in a fresh citrus-ish marinade topped with some local herbs, edible flowers and some jelly cubes as well. Sashimi without sushi rice paired together has never been my cup of tea but I would say the citrus-like sauce really did help cancel out most of the fishy taste from the fish. 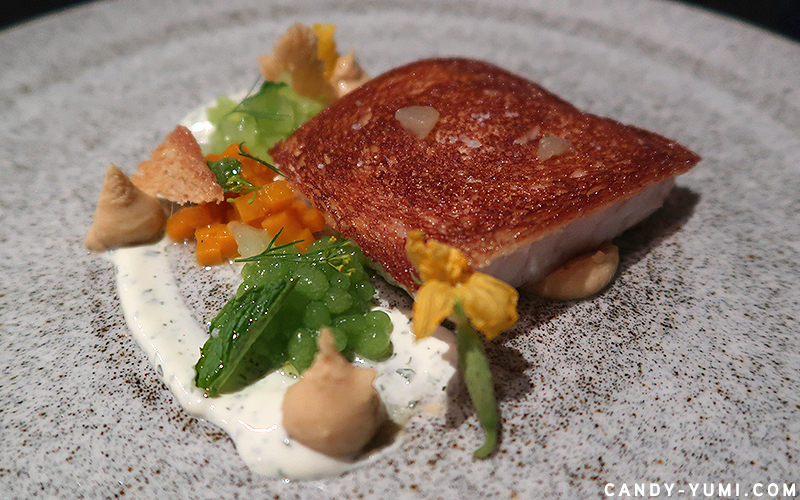 Next up is yet another surprise dish from Chef Alvin! 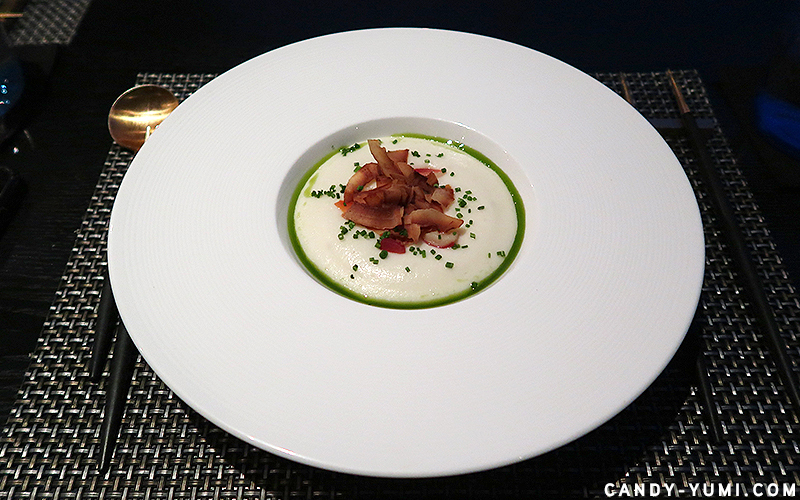 This one here is the Arctic Surf Clam Chowder - Warm potato cloud served with onion jam and coconut bacon. You guys, this is a super yummy dish!! In the beginning I couldn't really taste the clam/seafood and it kinda tasted like a good plate of yummy fluffy potato mousse. But there was a surprise hidden inside that's shaped in a pearl!! I did not remember to take a photo of it but when you poke it, all the yummy clam soup/broth would burst out of the pearl and bam!! You have a bowl of super yummy Clam Chowder! Another 101% will recommend! 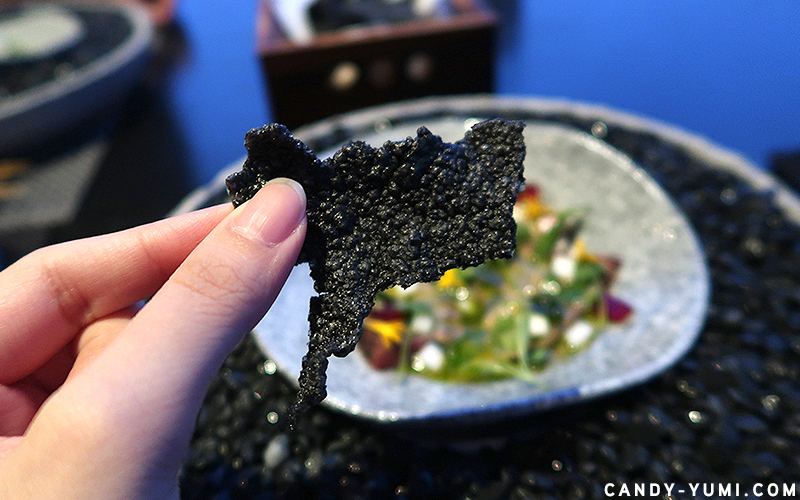 FYI, I'm not too sure about ala carte but this dish is included in the RM400+ set. I've once came across Coconut Bacon recipes online but this is the first time I've actually tasted it and I have to say the taste was legit!! 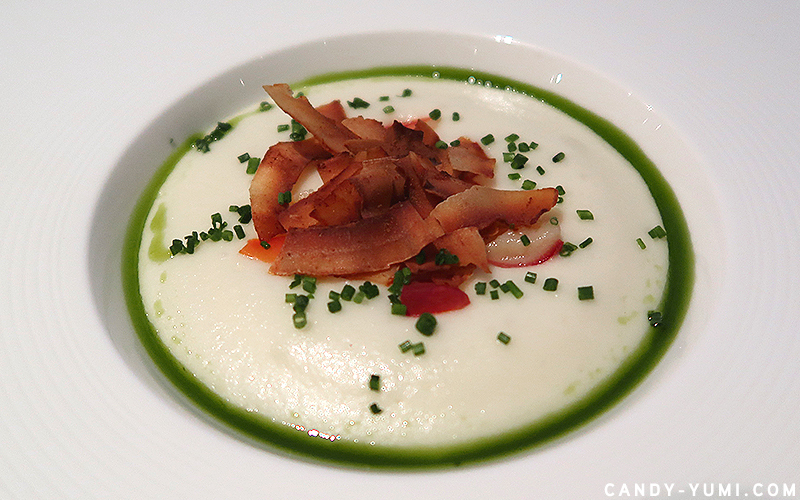 The coconut bacon really does have the smoky bacon taste and compliments the dish very well! If people sold coconut bacon in a packet, I'd be snacking on em all day long. 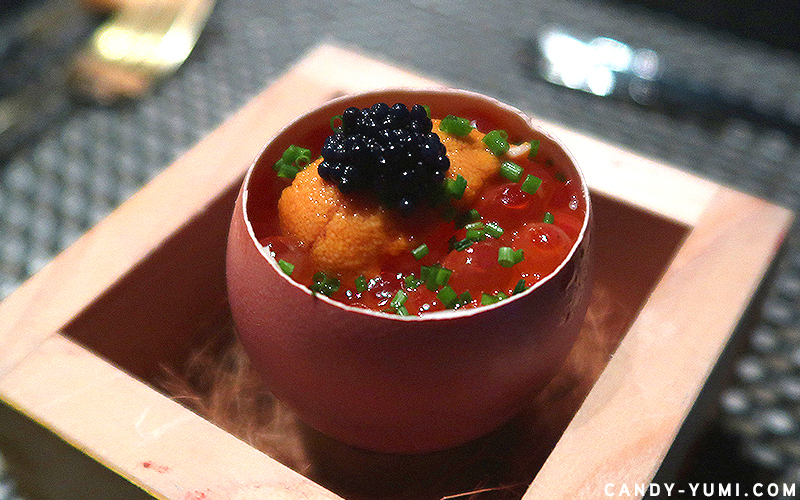 Chawanmushi with a luxury upgrade. Before opening the box, the waiter also told us that we might want to get our camera ready as there's going to be smoke coming out of the box too. 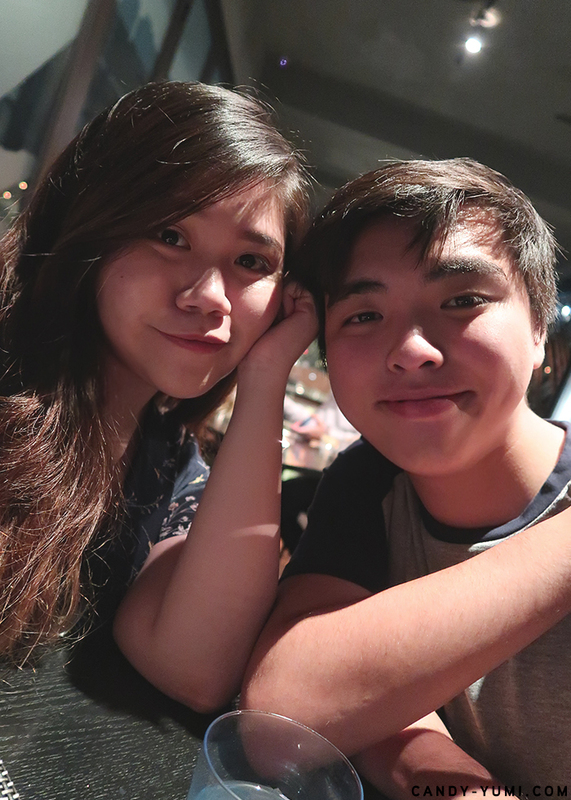 I just like it when waiters remind me to get my foodie cam ready for such moments :'D After the beautiful entrance that got me and the boyfriend going "Oooooh", each chawanmushi is transferred out into their individual wooden box nest. Literally every bite I took I felt like a million bucks. 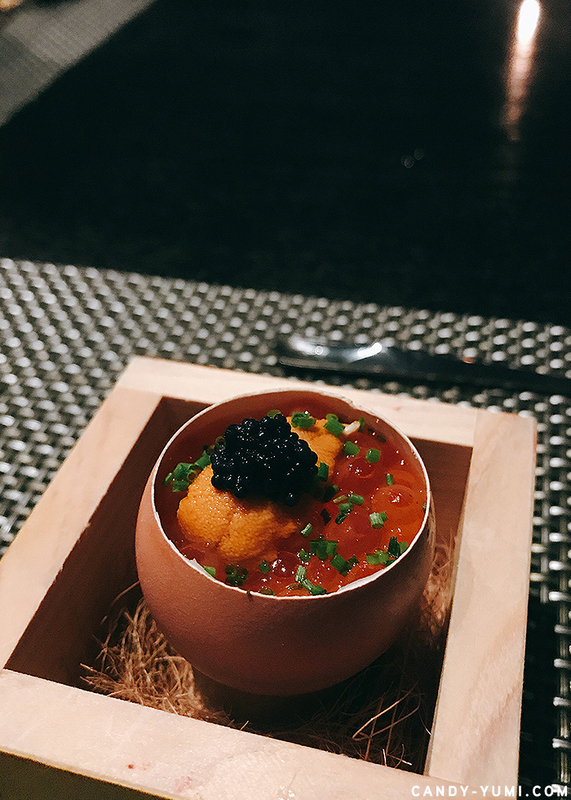 I never ever order ikura or uni in local japanese restaurants because they're generally ridiculously expensive in Malaysia so obviously I was a happy girl that night. I remember the last time I had ikura and uni was when I visited Shibuya about 4 years ago?? I've never had ikura or uni since T.T!! The next dish is another interesting one! 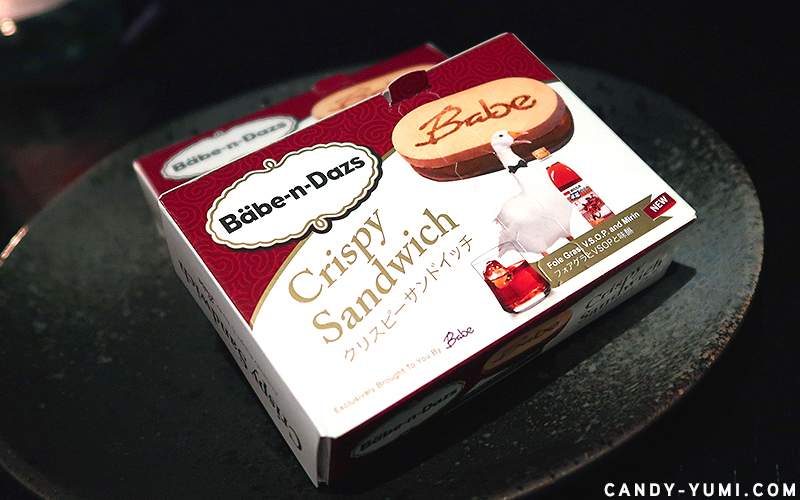 'Babe-n-Dazs' screams fun right from the packaging to it's taste. This here is a Foei Gras and Martell VSOP Ice Cream Sandwich with Monaka Wafers and the sides are coated with dark chocolate. 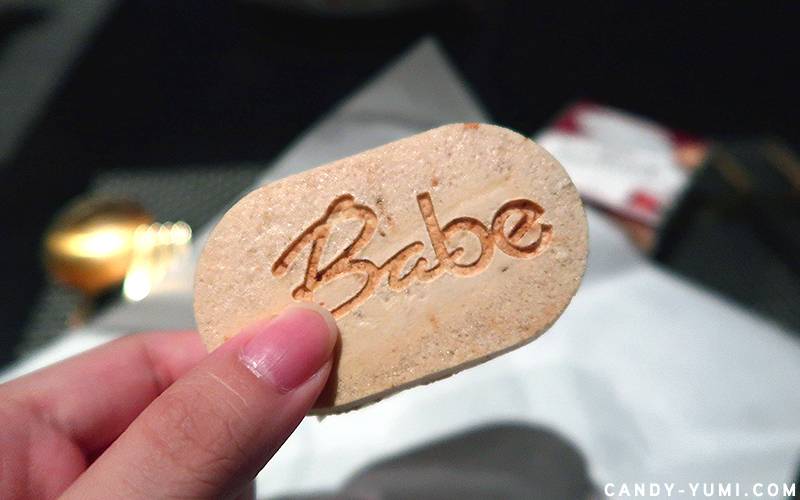 It was served exactly how an ice cream sandwich would be sold as - perfectly sealed inside this custom made 'Babe-n-Dazs' box. This is how it looks like. I was never a fan of Foei Gras so I only ate a bite or two and my boyfriend got to eat the rest of my share :'D According to him this definitely checks the yummy and unique checkbox! I mean if you put this in front of me without any context I never would've guessed that this was foei gras!! Moving on we have something that looked like a main but isn't a main? This dish here is a Breaded Hirame with Tzatziki which kinda translates to a Summer Flounder served with Tzatziki (a yogurt based sauce). On the side there's Cucumber Caviar, Kabocha Pumpkin, and pieces of toast. To be honest fish in general is probably my least favourite protein but this happens to be one of the rare times where I actually enjoy a fish dish. The flounder did not taste fishy and the top layer was seared beautifully. Crispy goodness. Cucumber caviar was interesting and with each bite you can taste a burst of refreshing cucumber juice. The tiny toast bread bits were absolutely /delicious/. So yummy that I kinda wanted an entire toast to snack on after this. 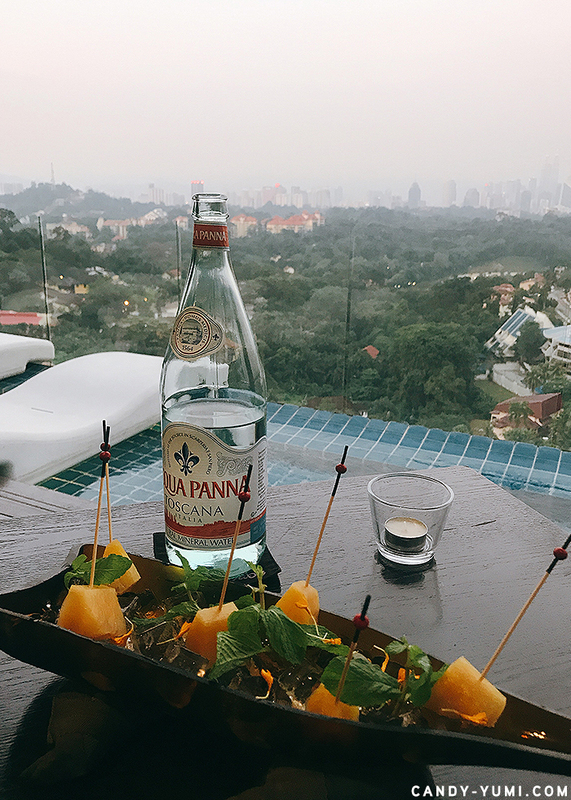 Overall the cucumber elements in this dish really does remind you of Summer days where all you want is a glass of chilled cucumber juice. We have now reached the mains. This also means that the night was coming to an end :( and honestly the waisekmao in me really didn't want the night to end even though at this point I was already almost full haha. Okay so, on the menu the standard option for your main course would be this Lamb Loin Steak and Jus. I mentioned that we ordered both Lamb and Beef to share so I will get to the Wagyu in a moment. 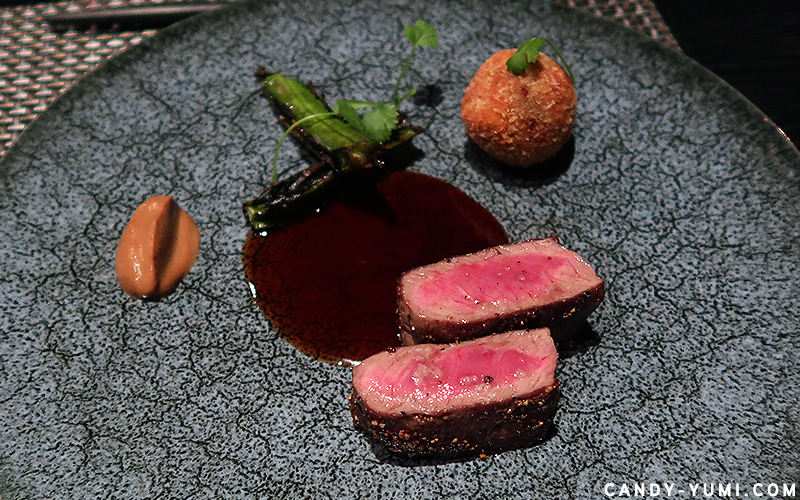 For now let's take a look at the Lamb Loin Steak. 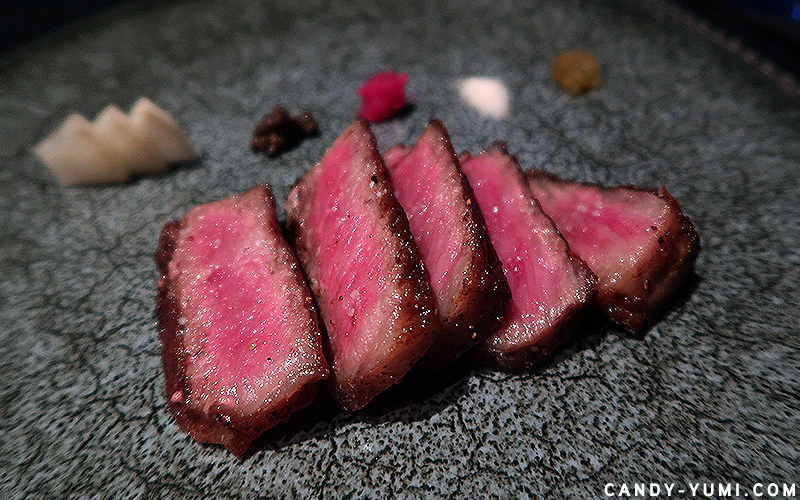 Finally we have the long anticipated A5 Kagoshima Wagyu Sirloin Steak (100g) cooked to medium rare. The thickly cut Wagyu slices were fat and juicy. A little too fat for me but the portion was just nice because I was sharing this with the boyfriend. Though if I'm ever here alone I probably wouldn't be able to finish this. The steak was seared beautifully and like most premium beef steaks all you need is a sprinkle of salt and it's ready to go. For this dish, Babe Restaurant has prepared it in a sense where we can savour this yummy premium plate of meat in 5 different combinations. I can't remember what is what but the white one on the left is pickled daikon (Japanese radish) and the white one on the right is salt. Out of the 5 'condiments' we can pair together with each slice of Wagyu, my personal favourite pairing was with the pickled daikon! 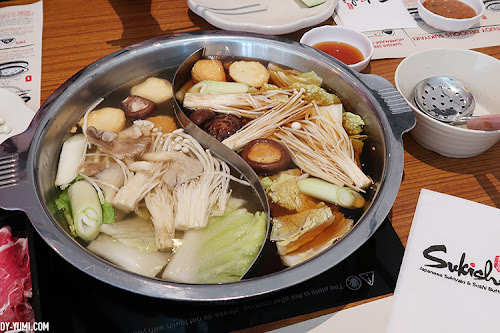 I love how the flavours go so well with each other and I also enjoyed the slight crunch from the daikon when eaten together with the juicy Wagyu that melts in your mouth!! 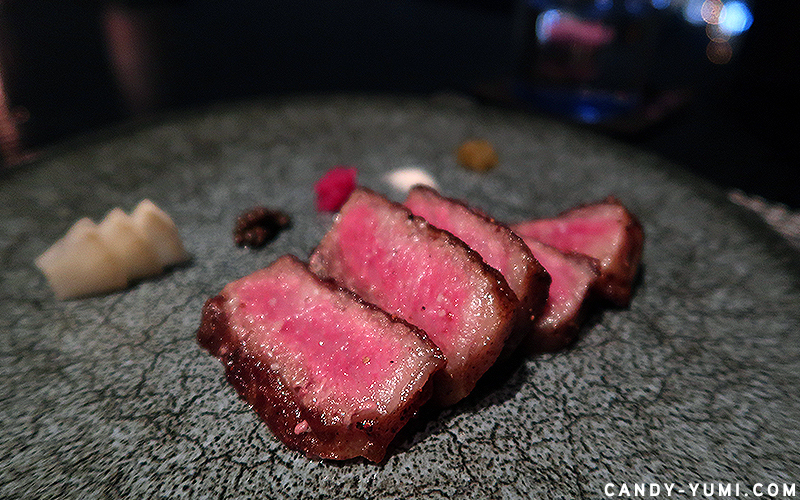 Do take note that there's an additional RM120 charge to switch from Lamb Loin to the A5 Kagoshima Wagyu. I think that if you can afford it and you're someone that appreciates and enjoys eating beef, this is definitely worth the upgrade. If you're there in a group, you could also order this from the ala carte menu to share. After our mains it was time for dessert! 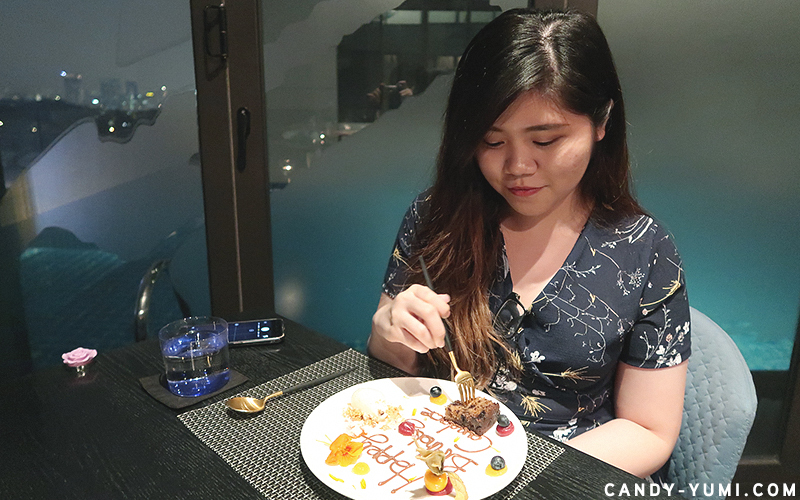 But before that the waiter brought out my 'birthday dessert' first hohoho. My birthday dessert was a slice of banana cake, some berries and a sorbet. I can't tell what sorbet it is but it kinda tasted like soy/tofu?? Before you be like me and go 'huh banana cake ah?' lemme tell you the banana cake was actually really really yummy and I ate all my doubts back!! 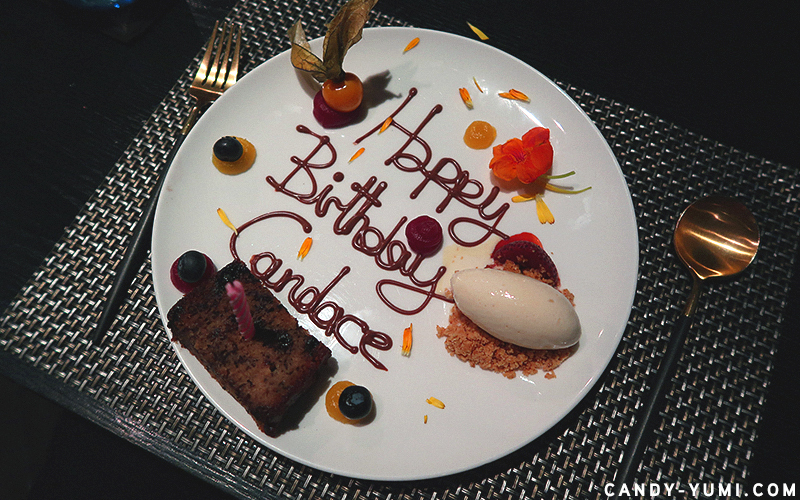 Instead of singing you Happy birthday in such a quiet dinner setting, Babe Restaurant shows you a little science-y 'Birthday Magic trick' instead. They brought me an empty birthday card and when they pour the liquid nitrogen on it, the Happy Birthday greeting appears!!! I genuinely enjoyed the banana cake ok haha. 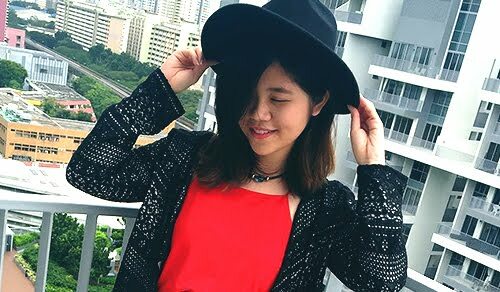 This photo quite nice right hahaha!! Ok so after my birthday dessert, we were served our 'actual dessert' of the night. 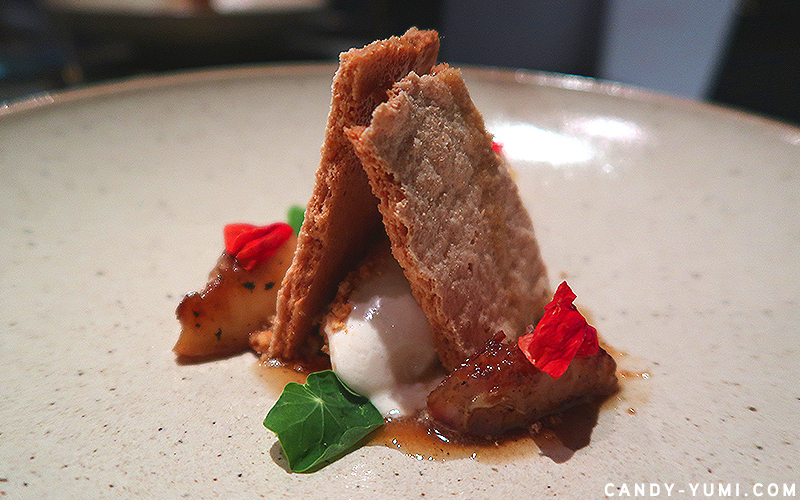 This here is called 'Summer Peach' featuring grilled white peach, rosemary honey, and Tofu sorbet/ice cream. I couldn't tell if they're the same, but I think the sorbet on my birthday dessert tasted pretty similar to this one here? I have a love hate relationship with this dessert. I'd give it a solid 8.5/10 for plating but taste wise I personally think that the spices on the peach was a little over powering for my liking and I didn't quite enjoy tofu flavoured ice cream either 😶. Nonetheless it's 100% fun and refreshing to see and taste a plate of dessert I've never tasted before anywhere else!! After dessert we both had a piece of Miso Butterscotch soft candy wrapped in edible wrapper. 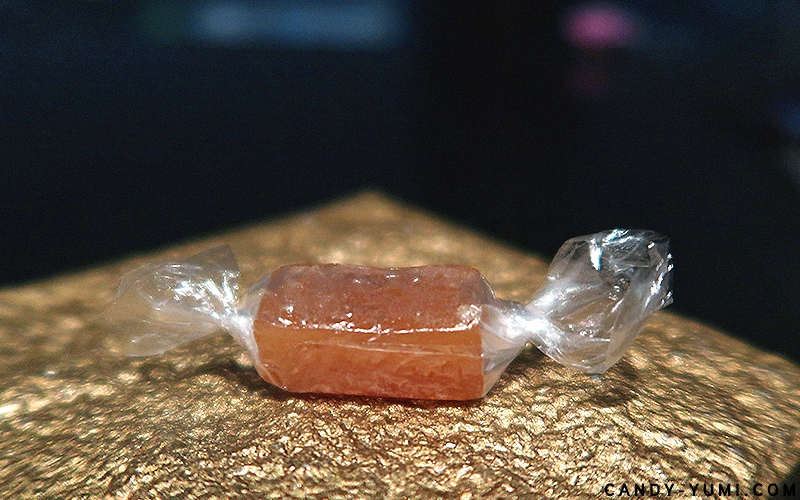 This tiny piece of candy looks so ordinary yet tastes so yummy. The sweet and savoury balance was great and if they sold a jar of these, I'd buy a jar home. 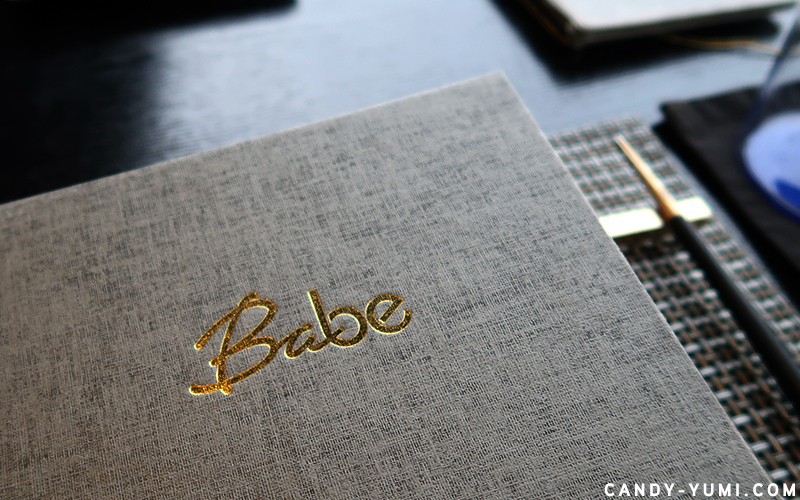 Overall, I enjoyed my early 21st birthday dinner at Babe Restaurant very much. 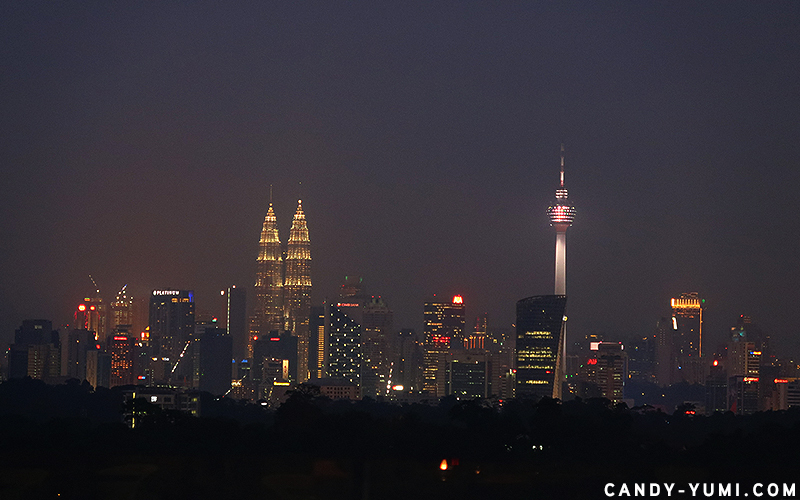 The KL skyline may be a little far but it's still pretty nice to watch the sky go dark and the KL high rise start lighting up one by one(I recommend booking your appointment at 7-7:30PM so you can witness this). There weren't many people during that weekday night so we got the best corner table available. This also means that we got our own little privacy along with the view. Oh and before we left the restaurant we went to say bye to Alvin and also thank him for all the yummy arrangements! The waisekmao is genuinely grateful!! During then we happened to bump into the owner of Babe, Chef Jeff Ramsey. We were about to leave so all we did was told him that we enjoyed our lovely dinner and the food was great. 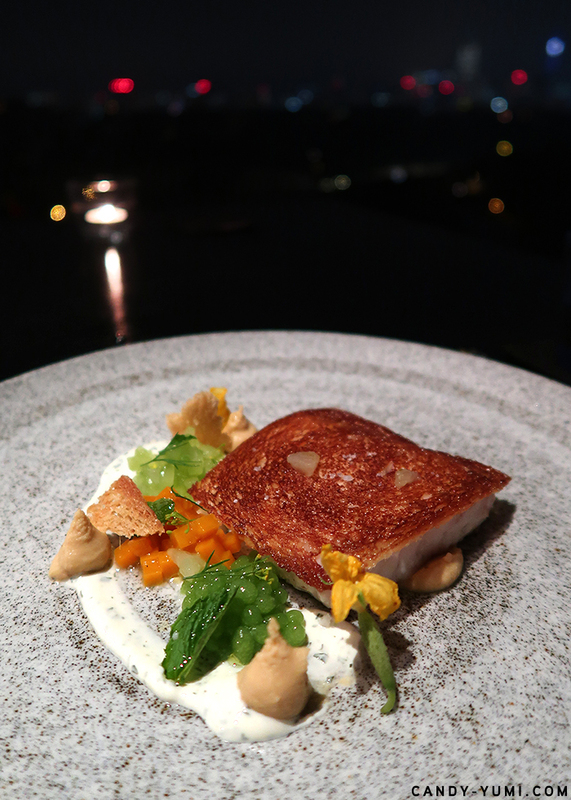 It was later on we found out that Chef Ramsey is a Michellin-Starred chef that has previously worked as the Executive Chef of Tapas Molecular Bar @ Mandarin Oriental Tokyo Hotel!! So hey! Now I can say that I've tasted some Michellin Star quality Japanese Tapas y'all!! 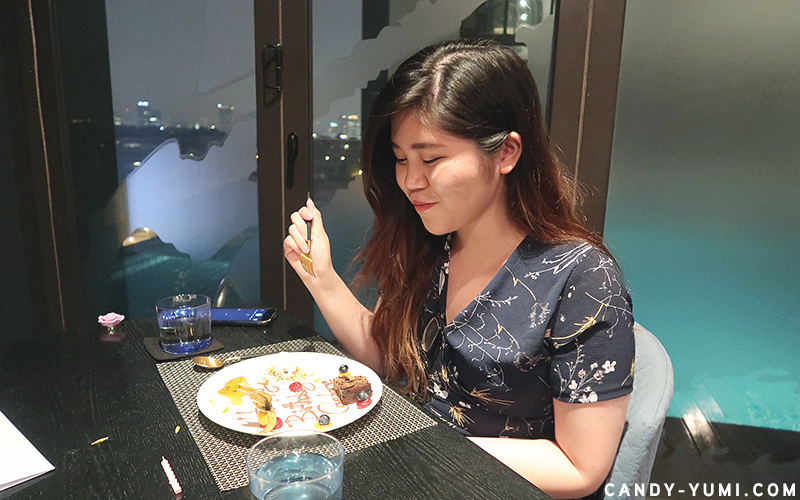 For those planning a visit, I believe Babe Restaurant is on reservation basis only so do remember to give them a call to book a table :D I had an enjoyable birthday dinner and with each cake I blow during my birthday I make a different wish. That night I wish that I'll be able to earn good money in the future so I can enjoy good food like this again and again without feeling any pain in my wallet. Even though this time my wallet felt no pain either haha but hey, I still wanna have a successful future ok.
101% will come back again!! Thank you for reading! It's been a while since I've came across a restaurant that I have been eager to share with everyone. 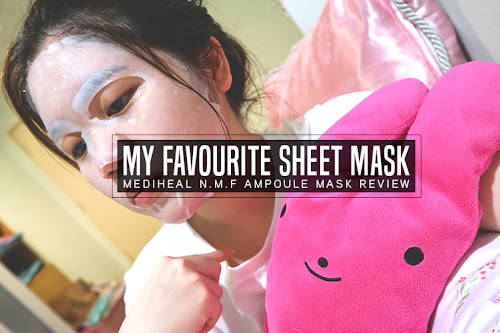 So as much as I enjoyed writing this, I hope everyone enjoyed reading this too!